As the outlaw player, Kite, you're on a mission of truth. Take a journey into a virtual world where anything is possible, and nothing is as it appears. Fight your way through contaminated levels of cyberspace as you take on and eliminate enemies, and unlock codes that will allow your to gate hack to even more enviroments - all in a desperate attempt to discover who or what's behind The World. 01-29-2014 scott Box Text The Saga Continues... As the outlaw player, Kite, you're on a mission of truth. Take a journey into a virtual world where anything is possible, and nothing is as it appears. Fight your way through contaminated levels of cyberspace as you take on and eliminate enemies, and unlock codes that will allow your to gate hack to even more enviroments - all in a desperate attempt to discover who or what's behind The World. 08-31-2011 scott Box Text The Saga Continues... As the outlaw player, Kite, you're on a mission of truth. Take a journey into a virtual world where anything is possible, and nothing is as it appears. Fight your way through contaminated levels of cyberspace as you take on and eliminate enemies, and unlock codes that will allow your to gate hack to even more enviroments - all in a desperate attempt to discover who or what's behind The World. 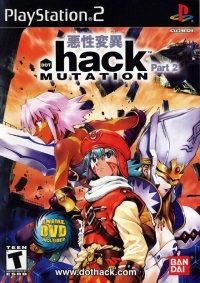 This is a list of VGCollect users who have .hack//MUTATION in their Collection. This is a list of VGCollect users who have .hack//MUTATION in their Sell List. This is a list of VGCollect users who have .hack//MUTATION in their Wish List.